Spending a week in Florida is an easy sell. Add in service projects such as building homes, helping seniors and receiving career advice, and it’s the perfect mix for a college spring break. For 25 years, NIU students have spent their break in Pensacola, FL, led by Jack King, director of student professional development for the College of Liberal Arts and Sciences. Over the years, King estimates over 700 NIU students have racked up over 25,000 hours in the Pensacola area, building homes with Habitat for Humanity and volunteering at places such as Ronald McDonald House, the Florida Department of Environmental Protection and the Council on Aging of West Florida. Huskies have raised roofs, raked yards, entertained seniors with dementia and served meals to those in need. And, in recent years, they’ve gained some insight into their futures by attending seminars led by NIU alumni and focused on careers in the service sector. They spent time enjoying the sugary-white beaches of Pensacola, too. King began bringing NIU students to Pensacola because he completed several internship assignments there as an undergraduate and saw firsthand the value of service in the community. “The contacts that I maintained made it easy to create the opportunities that would yield positive experiences,” King said. Pensacola is 1,000 miles from NIU but still a manageable drive. The timing was perfect for students from the Midwest to get a break from winter while serving and learning the value of giving back, he added. 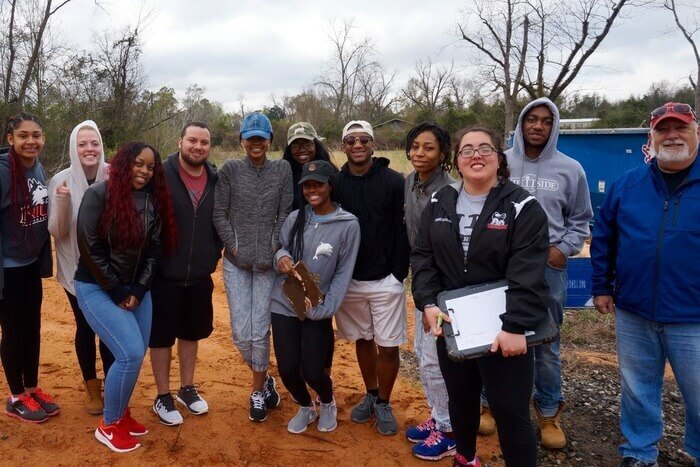 “The spring break service trip has become more than just ‘service’ and the great weather and location. Over the years it has led to great personal relationships among the students, adult volunteers and local residents. We have included alumni, faculty and even a former dean in the work crew,” King said. Additionally, the trip exposes students to different cultural experiences and fosters feelings of personal as well as group accomplishment. “The trip has resulted in a wedding and several job and internship offers during the past few years. The new career component in which NIU alumni living in the Pensacola area sharing their careers has been a great value-added piece,” King said. For its 25th year, the Pensacola Service and Career Seminar Spring Break Trip will include the usual work building homes and volunteer projects for seniors, and a new project – building wheelchair ramps. An NIU Alumni event is also in the works. The trip will also include a few other firsts: inclusion of a volunteer with physical disabilities, and another volunteer bringing her mom along. Lyrica Blake, a junior communication studies major, hopes to return to Pensacola this year and plans to volunteer again helping seniors.